(a disclaimer - I have not - yet- read any of the Sherlock Holmes stories… So I don’t know what canonical Mary is like) Another disclaimer. The more I watch of Steven Moffat’s shows, the more infuriating I find them - as a woman, and as someone who sometimes likes plots where a brilliant man doesn’t just wave a metaphorical wand to fix everything (sometimes I do like them, I just don’t like them every time in everything). And the more I talk to other people who share some of those frustrations, the more they grow, and the harder I find it to watch his shows without that getting in the way as I do. This is a man, who in Coupling, created three variations on a theme of women, none of whom I recognise in myself, and who, in writing for Doctor Who has managed to journey from the creation of Sally Sparrow (v. good), to Clara Oswald, who may not exist as a companion to “be rescued” - but whose entire character arc revolves around “rescuing the Doctor” at her own expense, which is almost as annoying, via the actual, literalfridging of Katherine Jenkins’ character in the A Christmas Carol episode, and who in Sherlock presented a highly compelling, gay, Irene Adler, only to have her fall in love with Sherlock and need to be rescued by her. Which is all to say, that while I often like Moffat’s wit and dialogue, and find his TV very enjoyable especially on a first pass, I have a bias against how he writes women, and was worried about what he might do with the character of Mary Morstan before we went into this season of episodes. I started off pretty positively with her. I have enjoyed Amanda Abbington’s performance hugely, and that she matched up and held her own, sparkily, with Sherlock in the first two episodes. And actually, the problem with Mary isn’t in Mary - just like it’s not in Molly, the other female character in Sherlock who has a huge amount of potential for great character and storylines. The problem for them is the boys. Because then came last night’s episode, His Last Vow, in which (PROBABLE SPOILER ALERT) Things Are Revealed About Mary. Except, none of those things are actually about Mary, none of them are important in her characterisation, and everything is about John and Sherlock, The End. Mary, it turns out has a past, and she’s worried about that past and what John will think of it, so she takes steps to cover it up - and gets accidentally (at first) and then deliberately (next) found out by Sherlock and revealed to John. Except. Nothing is actually really revealed. She appears to have worked for the CIA and been an assassin - but there’s no sense of what she did as part of that, or how bad it was. 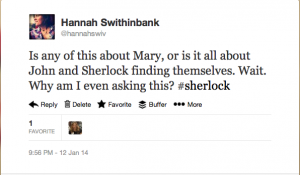 Apparently, Mary’s history, character development to the point at which she decided to turn away from that life, and what any or all of that might mean, don’t really matter - to Sherlock, or John, or even to her, hugely. What matters is her relationship with John and what John thinks of him. I’m actually struggling to enunciate, at this point, to explain just why I find this such a terrible relationship moment, and why it’s not a great way to treat a woman, or, as a writer, a female character you’d like to think of as an equal to the man you’ve married her to. Which I think actually underscores how prevelent this kind of thing is as a trope in fictional relationships: you don’t even blink at it first time round because you’re all, “Awww, John forgives her for her past.” But then you do a bit of a double take. Look, John, you married the lady. You say you love the lady. Which is to say, you (apparently) think she matters and not just as the person she is and things she does affect you. Even if she thinks that the most important thing right now is your good opinion, you’re supposed to say that actually, it isnt’ - her opinion of herself is. And you’ve just endorsed the idea that she should be ashamed of her past and it is in your gift to forgive it, as if it’s a sin against you - which is isn’t by the way - without even paying attention to any of it that isn’t the lying to you bit. Hello. Yes, you probably do need to work through the lying bit - but, I don’t know how you’re going to do that if you don’t bother to learn why she lied to you in the first place. It’s going to come back to bite you. It wouldn’t be as bad, if you thought there were lose ends hanging that Sherlock might return to, in dealing with the relationship of John and Mary Watson. But there’s absolutley no sense of that at all. Sherlock ‘solves’ it, fixes it, and sacrifices himself, thus showing that he has Grown As a Person. There will be, to judge from the tone of the ending of last night’s episode, No More Worries about Mary - at least in terms of her relationship with John. I’m sure her past will come back to bite the Watsons, presumably when she gets killed off (since Mary dies in the stories, it’s not unreasonable to assume she’ll be killed off in Sherlock - and that’s not necessarily a problem: it’s the how that will matter). If I were a betting woman, I’d bet Moriarty comes back, tries to use Mary’s past against John and Sherlock, Sherlock will run around manically trying to save them all, and Mary will sacrifice herself for John and Sherlock. Because that’s how this relationship has been set up: it’s all about what it means for John, and for John’s relationship with Sherlock Holmes.